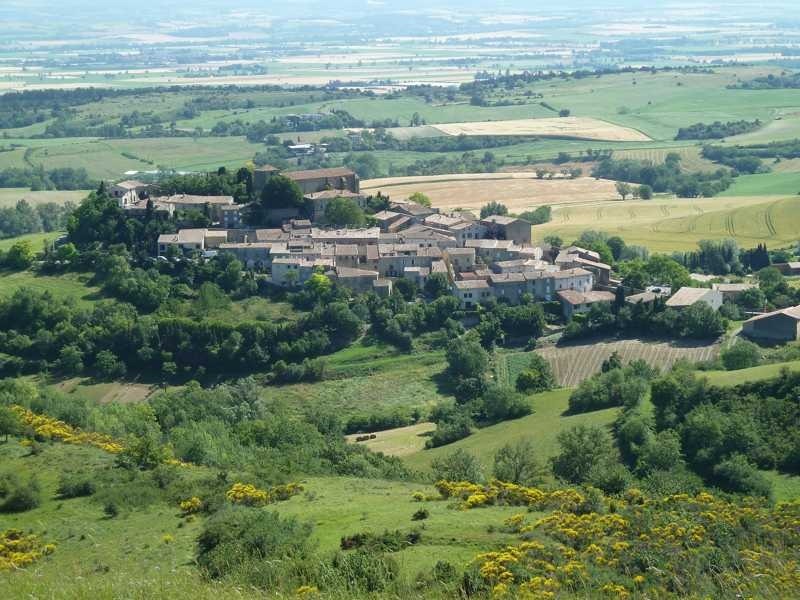 A few kilometres to the west of us, between Fanjeaux and Castelnaudary, is an area called the Lauragais, named after what I’d call little more than a village, Laurac. Laurac is overlooked from the south at a height of about 400m/1200ft by an impressive escarpment. We saw it first as part of a strenuous walk some years ago when farmer Luc offered to drop us off in the middle of nowhere to walk back to Fanjeaux. It’s called the colline des vents, or some such phrase, and with good reason; life can get decidedly blustery up there. Not only are the views impressive, though, but the wildlife can be also. Once here we watched in awe as a Short-toed Eagle (Circaetus gallicus) gracefully hovered in the up draught above the escarpment, dropped to catch a lizard or snake (we couldn’t quite tell which), then rose back up again and proceeded to devour it on the wing. 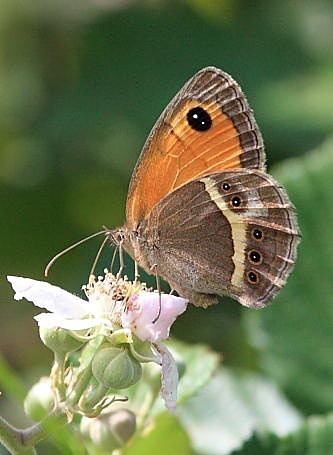 In the bushes atop the escarpment is also where we spotted our first Spanish Gatekeeper butterfly (Pyronia bathseba) and where Francine has enjoyed playing David Bellamy – rummaging around in the undergrowth for flowers. It’s always worth a visit, even if a little windy. This is one of those parking spots where a four wheel drive vehicle comes in handy. This being a nice a dry day with firm ground, we didn’t actually need four wheels driving but the ground clearance is necessary crossing the dip that you have to get over to get off the road. In our previous, rather more low-slung vehicle, I’d grounded the car’s tow bar. Ouch! This time, apart from the effrontery of a local being parked in the same spot, all went well. Francine began her search and I started looking for butterflies. Spanish Gatekeepers were around again but didn’t pose as well, even when encouraged to find a new perch. Francine soon became excited at a new find and set about recording it for posterity. Fortunately it was posing much better, being in a rather more sheltered spot and keeping relatively low to the ground in the grass. 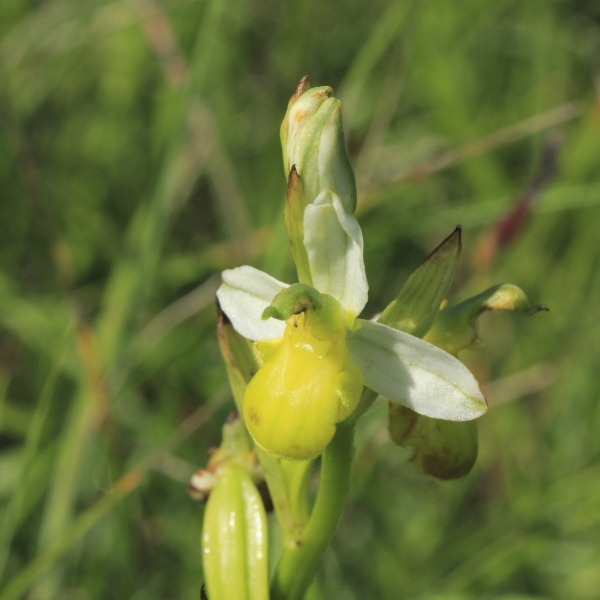 It was an orchid, the same shape as a Bee Orchid, but with very pale, plain “wings”. 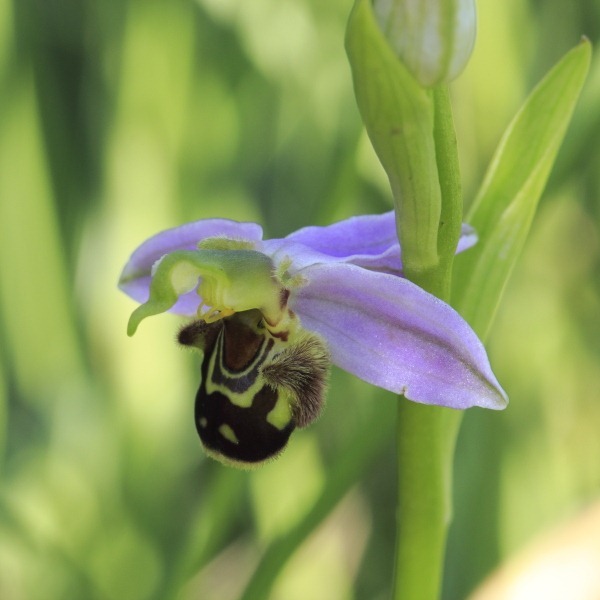 Indeed, nearby was an example of the Bee Orchids (Ophrys apifera) with which Francine is already familiar. The newcomer was not in the wild flower books that form part of Guillaume’s library. However, with a nifty bit of research grâce à McWiFi, Francine thinks this beautiful new flower may be a White Bee Orchid (Ophrys apifera var. clorantha). Confirmation or otherwise will be needed back at home base.